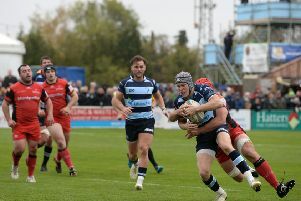 Bedford Blues have made two changes for their final home game of the season as they welcome Yorkshire Carnegie to Goldington Road this afternoon. The two teams have already met three times this season with Bryan Redpath's men securing wins on each occasion but Bedford will be keen to stop them making it a clean sweep. Bedford make just two changes to the team which defeated London Scottish a fortnight ago as Ollie Dodge starts at outside centre in place of Piers O'Conor while Jake Sharp gets the nod at fly half ahead of Myles Dorrian.